A freshly decorated, traditional styled luxury 4 bedroom home pool home with private pool and upgraded furniture. Located just 25 minutes from Disney and 35 minutes from Universal and SeaWorld this home is situated in a safe, quiet, gated residential community close to a large variety of shops and restaurants. 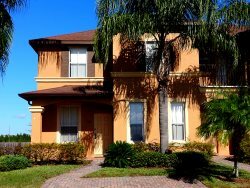 Situated in a quiet, friendly, residential community with easy access to all of the Orlando attractions as well as a wide choice of restaurants, shops and even a golf course only minutes away. This home has paved driveway parking with a path leading to the front door. It opens into a tiled entryway where this home has upgraded furnishings throughout. The Living Room has a comfortable and elegant matching sofa, loveseat and armchair, a coffee table and area rug on a tiled floor. The Dining area has a tiled floor with a large wooden dining table which seats 6. The Kitchen in this home is a well planned area with double stainless steel sinks, dishwasher, cooker, microwave, kettle, toaster, fridge/freezer, blender, and coffee maker. There is a wooden kitchen table which can seat 4 and a breakfast bar with 2 stools. The wonderful Family Room is a large open room with tiled floor, colorful area rug and matching leather sofa, loveseat and armchair. There is a coffee table and an entertainment unit with large TV, VCR player and DVD player. There are sliding glass doors opening onto the screened pool deck. The Master Bedroom has a King size bed with blue/yellow patterned comforter, carpeted floor, closet, upgraded furniture, Television/DVD player and sliding glass doors leading out onto the screened pool deck. The Master Bedroom has a lovely, bright en-suite Bathroom with separate his and hers sinks, toilet, full size bath, separate walk in shower, tiled floor and door leading out onto the screened pool deck. Bedroom 2 has a walk in entry corridor, a Queen Bed with blue/white patterned comforters, television, carpeted flooring and a large closet. This Bedroom has an en-suite bathroom with single sink, corner bath, toilet, separate walk in shower and tiled floor. Bedroom 3 has carpeted flooring, 2 Twin beds with blue/white patterned comforters, television and closet. Bedroom 4 has 2 Twin Beds with Mickey Mouse comforters, Mickey Mouse television, closet and carpeted floor. There is also a brightly painted Games Room with Air Hockey Table and Pool Table for your enjoyment. The Screened Swimming Pool is rectangular with separate Spa, loungers and table with parasol. The pool screen is bordered by a tall hedge giving the pool maximum privacy. Amenities Freshly decorated Large Private Screened Pool Fully Equipped Modern Kitchen Close to all Orlando Theme Parks Wifi, DVD Player, TVs Upgraded Furniture Local Area Outside the neighborhood nothing is too far away. A Publix Shopping Plaza is within easy driving distance. There is a Publix supermarket, CVS drug store, Bank, ATM, Fuel station and a selection of restauarnts close by. Area Attractions The home is 15 miles from Disney and the Theme Parks and 30 minutes drive from Orlando International Airport. In addition to being close to the Prestigious Highlands Reserve Golf Course and Driving Range, the resort is only a short drive from a host of other highly rated Central Florida golf courses. These include Southern Dunes, Orange County National and Reunion Resort.